Kevin Wright is searching for a bear. "I've got a yearling that has become very adept to dumpster-diving," the Colorado Division of Wildlife's district wildlife manager for the Aspen area said this week. "This bear has lost its fear of people and has become aggressive." The young bear has become a serial home-raider scrounging for food, opening lever-handle doors and refrigerators. Wright tranquilized and moved the bear's sibling earlier this month. Now he is attempting to trap this opportunistic bear. With unseasonably hot and dry weather speeding Colorado into advanced summer conditions, Wright's young burin is one of many hungry bears rummaging through trashcans, barbecue grills and bird feeders throughout the state. 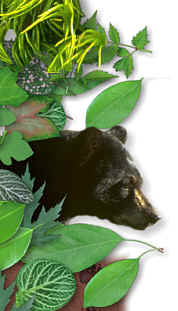 Under normal conditions, black bears forage for leafy greens at higher elevations through late July or early August. Dry conditions have pushed the blooming cycle up and reduced the time bears have to eat their greens before the berries and acorns arrive next month, said Tom Beck, the Division's Dolores-based wildlife researcher. "Right now, it's not a berry or acorn shortage because they haven't come yet," Beck said. "The problem is the greenery. In most years along the Uncompahgre Plateau, I would expect to see the Aspen peavine flower in late June. Now, I've seen it flower June 6." District Wildlife Manager Mike Reid in Pagosa Springs said the dry weather has taken its toll in his area. Bears are drinking from open septic tanks for water. "It's been real dry, and water is water," he said. Besides the food shortage, bears are creatures of habit. Many of this year's bears formed their trash habit last year when they lost chokeberries and acorns to wet weather, said Melody Miller, district wildlife manager in Durango. "Last year, sows brought their cubs down for food and some of those (year-old bears) have returned," she said. "Now, if we don't get wet soon, we're going to lose that food again. The bears are going through a hard time." Two bears were killed on June 1 and 2 in the Durango area after invading human habitat. One bear was shot by a landowner when the bear attempted to enter the owner's home. Another bear was killed because it was killing chickens. The Division's bear policy emphasizes providing the public with information on how to avoid black bear encounters by removing all possible bear attractions. The Division traps and relocates bears as little as possible because it usually doesn't work and there are few places to move them. If Division officers are forced to trap a bear, it is relocated only once. Part of the Division's directive is to kill a problem bear the second time it is trapped - the so-called "two strikes" policy. That's because a bear that has been trapped a second time is habituated to human food and will only become more aggressive in its search for calories. Relocating a bear is not always successful because of the animal's ability to travel long distances. "A high percentage of bears will go right back to the area that they were trapped and become an even bigger problem," Miller said. Colorado's bear population is not exactly known, but wildlife officials estimate there are between 8,000 and 12,000 bears in the state. Most of those bears live in the southwest and south-central areas at mid-elevations of 5,000- to 9,500-feet where they feed off of Gambel's oak, a native shrub that produces acorns. Wildlife managers agree that dry weather is only half of the problem with bear and human encounters. Colorado's population explosion, with more and more people moving into bear habitat, simply increases the chances a bear will find food lying about. "A lot of us have been worrying what would happen if we had another drought like we did in the 80s," Beck said. "The landscape of 2000 is very, very different. We've got thousands of thousands of homes built in bear habitat." Surrounded by homes where trash and food are sometimes left outside, bears are attracted by the smells and come to the human environment for food, especially if natural forage isn't in the woods. The best solution to reduce bear encounters, wildlife officials said, is to eliminate the temptations. "Bears think with their stomach," Wright said. "They follow their noses and think with their stomach." Trash needs to be in steel, bear-proof containers. Pet food needs to be inside the house. Bird feeders need to be out of reach. Barbecue grills need to be kept clean. And a bear only needs to eat from a trashcan once to learn where to get easy food. Some towns, such as Vail and Aspen, have ordinances requiring homeowners to bear-proof their trash. Snowmass Village has the toughest ordinance, Wright said. Snowmass enacted a broad ordinance requiring enclosed dumpsters in 1994. Officials tightened the regulations last year after a sow and three cubs were killed because they became too aggressive while scavenging for food. Snowmass' laws require all trash - whether household or construction - to be bear-proof. Also, animal safety officers can pass out warnings and tickets to trash violators. Most of the community supported trash-control laws to prevent more bear killings, said Lori Smith, a Snowmass animal safety officer. "We also encourage people talking to their neighbors and everyone reminding one another to take care of their trash," Smith said, adding that the town mails out a newsletter about bears to every resident and posts signs in areas where bears have been sighted. Since the ordinance has taken effect, wildlife officials haven't had to relocate or kill any bears, she said. "We couldn't do this without the community support," Smith said. • Keep doors and lower, ground level windows locked. • Make your property safe by keeping garbage out of the reach and smell of bears. Use bear-proof trash containers. Contact the Division of Wildlife for designs or your waste management company. • Hang birdseed, suet and hummingbird feeders on a wire between trees, high enough to keep a bear from reaching as well as out of the bear's reach if it climbed the tree. Don't hang the feeders on your deck or porch. Bring all bird feeders in at night. • If you keep bees, treat the hives and other equipment the same way - out of the bear's reach and surrounded by reinforced fencing.